This morning, Google and VIZIO announced new P-Series TVs with Google Cast support built directly into the display. What does that mean? Well, that means that you don’t need a Chromecast in order to Cast all of your favorite content to your new VIZIO TV. They also announced new soundbars and speakers that all support Google Cast. With the new P-Series, VIZIO seems to have ditched the typical Smart TV functionality and instead just gone with Cast support, although they are calling it SmartCast and have an app to go along with it. They are shipping the new TVs with a full 6-inch (1080p) Android-powered tablet as a replacement for the typical remote, because after all, you do need a smart device like a tablet or phone in order to really take advantage of Google Cast functionality. Keep in mind that your current phone or tablet will also work for Casting, but VIZIO’s tablet adds some extra functionality. The new P-Series also supports casting up to 4K, is supported by iOS and Android apps, and starts at $1299 for the 55-inch model. If you want to go H.A.M. on a new TV, there is a 75-inch version with Google Cast that can be had for $3799. 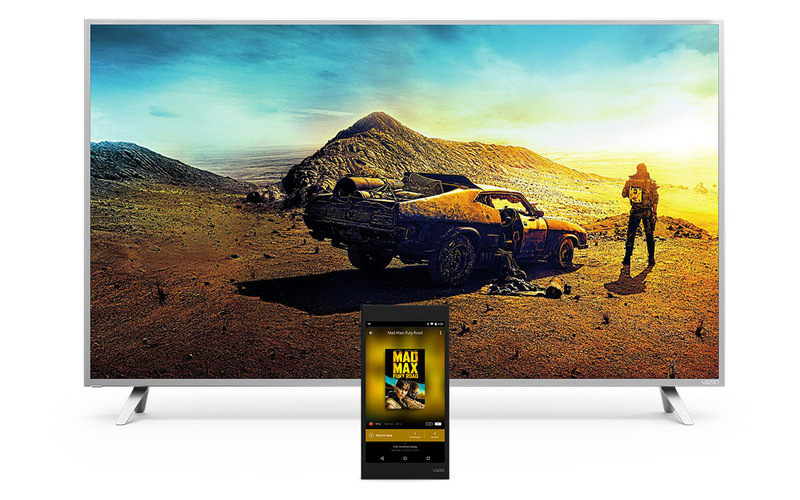 To learn more about the new P-Series from a TV nerd standpoint, head over to VIZIO’s site. As for the soundbars and speakers, VIZIO is introducing standard-shaped soundbars as your central speaker, but they also have a slim-shaped subwoofer and set of satellite speakers to round out your surround sound setup. If you want sound to fill a room or take with you instead of home theater products, VIZIO has new Crave 360 and Crave Pro speakers that should do the trick. The 360 is a cylindrical styled speaker (think Amazon Echo) that is portable and carries an 8-hour charge. Then with the Crave Pro, you get that SONOS-like sound without the portability. You can learn more about the new speakers here and here. The VIZIO SmartCast app, which is what powers most of the functionality behind the new P-Series TVs can be found at Google Play.